The symptom domains of primary negative symptoms, insight and cognitive deficits in schizophrenia appear to overlap on a number of aspects. These domains are: (1) relatively independent of the psychotic, affective and secondary negative symptoms domains; (2) relatively persistent; (3) show only marginal improvement with the available antipsychotic treatments; (4) are strongly correlated in cross sectional measures, and (5) associated with outcome measures. Despite such similarities the relationship between insight, negative and cognitive symptoms is yet to be clarified. Are we looking at independent categories of symptoms, at a primary versus secondary symptoms type of correlation – e.g. insight deficits secondary to cognitive deficits – or maybe at a common neuropathological “lesion” or endophenotype with multiple manifestations? Is the functional deficit an effect, a cause or just another category that correlates with insight, negative and cognitive symptoms? In this chapter we will selectively review cross-sectional and longitudinal data to clarify the relationship between these schizophrenia domains. We conclude that the evidence to date suggests that we are in fact looking at independent symptoms domains. This conclusion has important applications. 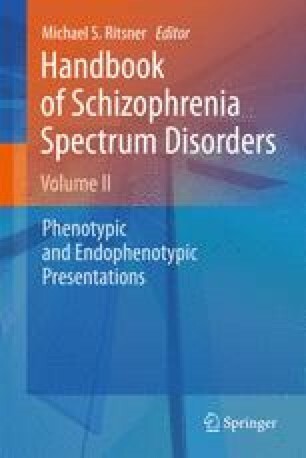 At a theoretical level the implication is that, similarly to its clinical presentation, the underlying neurocircuitry and pathophysiology of schizophrenia is diffuse and heterogeneous rather than localized and homogeneous. At a more pragmatic level the relative independence of the cognitive and negative symptoms suggests that effective interventions might need to selectively target each of the domains.